There’s an old adage about wisdom that says “A wise man knows when to break the rules”. This wisdom comes from years of experience and is learned slowly over time through solving countless problems. Bureaucrats on the other hand hide behind rules and blindly enforce them no matter how silly they are and how bad the consequences are. After all, the rules need to be followed. We’ve all had experiences with steely eyed bureaucrats enforcing ridiculous rules. Try getting a visa to visit some emerging market countries. An exercise in waste and certainly a process with no concept of customer value. 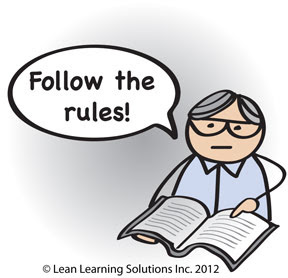 In Lean we equate rules with standards. We teach people that standards are there to be followed. Not blindly like bureaucrats but followed and if we can’t follow them, then pull the andon and raise the problem. By raising the problem we give ourselves a chance to problem solve and eliminate the root cause from happening again. In Lean, standards are there to tell us when we can’t follow the standard. They are there to help us identify problems. So expect standards to change over time as they are continually improved through problem solving. In summary, we need standards and we need rules. We need to follow the rules and follow the standards but only until something causes an interruption or disruption so you can’t. Then instead of blindly trying to follow them, raise the problem and get your team members involved in solving the problem. This allows us to build in the wisdom of experience and countless cycles of problem solving and learning into the improvement of the standards.